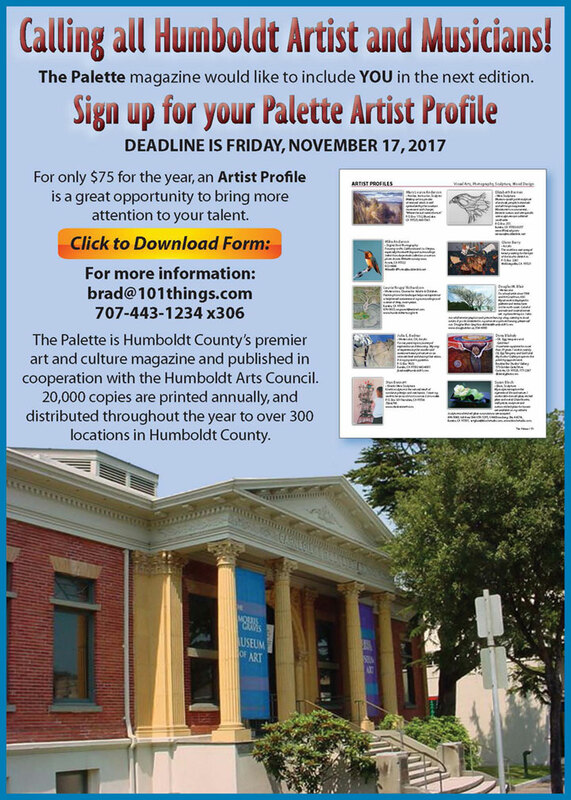 The Palette Magazine is the leading guide to the art and cultural resources in Humboldt County. With more artists per capita than any other county in the State, Humboldt County boasts an abundance of museums, galleries, dance companies, writers and poets, filmmakers, theatre groups, musicians and cultural events. Residents and visitors alike can enjoy the many opportunities to take part in the arts, and this edition of The Palette highlights them all. Save this guide as your arts and culture reference for the whole year and support the wonderful sponsors and artists contained within. For additional copies contact 101 Things To Do at 707-443-1234, ext. 300. Enjoy all that the arts have to offer!